Any time you have to put your cat in a carrier, you know they’re not going to be a happy camper. Cats are if nothing else creatures of habit – they like to stick to their routine in their own little bubble of the world, content as can be. So anytime you have to take your cat to the veterinarian, the kennel, or anywhere outside of that bubble it’s not going to be easy. That’s why having a nice cat carrier is way more important than you might think. The more comfortable you can make your cat during their forced excursion out into the wide world, the better the whole process is going to be (though we can’t promise your cat will be purring in any cat carrier). So, what makes a good cat carrier? Well, we’ve put together a little list of some of the best cat carriers available to pet owners today to make it easier for you to find the perfect one for your kitty. That the carrier is neither too big nor too small for your cat. That it actually stays shut. We don’t want any cats on the loose! If your cat carrier isn’t the right size, it can be very uncomfortable for your kitty. If it’s too small, well, they will obviously be squished in there and that’s no fun. It it’s too big, they can topple around inside while you’re carrying them. Most cat carrier models will come in a few different sizes, so always make sure you are getting one that’s the proper fit for your cat. Generally, a cat carrier should be 1.5 times bigger than your cat. That way, they can move around but still feel secure. And, like we said, the carrier door or opening should be nearly impenetrable so your feline doesn’t manage to sneak its way out of there! You should also take your cat’s personality into consideration. If you have a squirmy (but cute) little devil, you may want a carrier with multiple openings so it’s easier to get him inside. Some cats also don’t like the hard, cold plastic of typical cat carriers, so perhaps your cat will need a soft carrier. There are a lot of little details like these that you could consider when choosing a cat carrier – but remember to put size and security first! As you may have assumed, we took some of the factors described above into consideration when crafting this list of cat carriers. That being said, the size of the carrier wasn’t something we necessarily looked at. Cats come in all shapes and sizes, so we can’t really grade a carrier on its size since what is great for one cat could be horrible for another. Otherwise, we mostly looked at the quality and construction of the carrier (because it may have to withstand a very irritated cat). The ideal cat carrier should be safe, secure and durable so you can use it for years to come. On this list you will find both hard and soft cat carriers, ones with different opening points, and more. In short, we wanted to give you a variety of cat carriers so you can find one that will best suit your feline friend. Let’s make your cat as cozy, comfy and secure as possible! These carriers will help you make minimize your cat’s stress levels anytime you have to take him or her away from home. This Carrier Weighs 8.8 Pounds Empty. The exact dimensions of the carrier are: Length 24", Height 16", Depth 16"
This roomy and airy soft-sided cat carrier is like a small piece of luxury for your cat. It’s a great option for both you and your cat. For you, there are four different access points for putting your cat into the carrier, including a top opening because that can sometimes be much easier than shoving your cat into an opening head-first. These openings also have three different “privacy settings” for your cat. Kind of like a camping tent, the openings can be fully covered, semi-open with mesh panels, or fully open if your cat wants something comfy to snooze in at home. These different panel layers roll up and are easily secured or released. The mesh is made of a heavy-duty rubber so it will be very difficult for your kitty to scratch and tear the mesh, if you were concerned about that aspect. Inside, you will find a super plush pillow that’s easily removed for washing purposes. The carrier also has side pockets in which you can store any supplies you may need while transporting your cat. And, it has locking zippers (to prevent escaping) and seatbelt loops to secure the carrier in your car. After all, your cat should be as safe as you when you’re driving! It’s really great for carrying because of multiple handles and adjustable shoulder straps, and is foldable for easy storage. It comes in two sizes and five different colors. 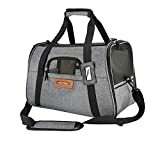 The carrier rates very highly among cat owners who bought it on Amazon, many of who raved about how much easier it made their trips with their cats. AIRLINE APPROVED PET CARRIER- ACCEPTED as a SOUTHWEST Airlines Pet Carrier, AMERICAN Airlines Pet Carrier, JETBLUE Pet Carrier, DELTA Pet Carrier Plus VIRGIN, ALASKA, FRONTIER, ALLEGIANT, UNITED & MORE. 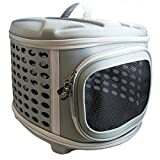 Carrier measures 17.5"L x 10"W x 11"H.
ULTRA-SAFE, EXTRA DURABLE- UPGRADED to REINFORCED Polyester & CLAW-DEFENSE MESH on top & 4 sides ensures your pet has ample VENTILATION and AIRFLOW & it WON'T TEAR like flimsy, cheap carriers while MINI ZIPPER BUCKLES ensure your pet stays tucked safely inside. 2 FLEECE PADDED MATS- Ensure your pet stays clean and comfortable throughout the trip. Spills and accidents are no problem - simply switch out the removable fleece pads. Pads wash up quickly by hand with a little soap and water. YOUR PET FITS - OR THEY DON'T FLY- As the creator of this airline approved pet carrier we can say "IF YOUR PET DOESN'T FIT IN THIS, THEY CAN'T FLY UNDER YOUR SEAT." So we encourage you to MEASURE YOUR PET BEFORE YOU BUY to SAVE YOURSELF TIME and if for any reason you get this home and you're not satisfied, we'll happily refund you. If you need an airline-approved cat carrier, stop shopping around. This is the carrier you need. A lot of airline-approved carriers are very small, which isn’t good if you have a larger cat. And even if you have a small kitty, they will want space to move around during a flight since you won’t be able to let them out at all. This is the largest of approved airline pet carriers and is accepted on most major airlines. It’s also very safe and super durable with reinforced polyester and claw-proof mesh. It has three opening (including a top lid) to easily get your cat in and out, all of which zip and buckle shut. There’s also pockets to store treats and anything else you may need. The Pawfect Pets cat carrier comes with two fleece mats so your kitty is extra comfy and cozy. And because of all the mesh openings, there’s plenty of ventilation so your cat won’t feel claustrophobic or closed off from you. Plus, this carrier comes in four colors and has a very stylish look like a lot of airline luggage. Now, if a soft carrier won’t hold up against your cat’s clawing and scratching then you are probably in the market for a hard case cat carrier. Well, we recommend this one. It opens from the front like a typical cat carrier, but it also has a top opening to help you load your kitty inside. The top open even opens from either the left or right side. This cat carrier comes in two sizes: a 19-inch and a 23-inch. It’s also very secure and durable. The hard plastic upper and lower parts of the kennel snap together with four latches, and you can use the included screws for extra reinforcement. Unfortunately, it doesn’t come with any soft cushions so you’ll have to figure out how to make this one comfy yourself. But for a basic cat carrier, this one is really great. It’s affordable, sturdy and a best seller among pet owners. PERFECT SIZE FOR A TRIP TO VET: A pet carrier that gives you the best features of both hard and soft carriers! 17" long by 13" high by 14" wide, it's suitable for cats, small dogs, and other pets. HARD BASE & PROTECTION: A hard top and hard base give you sturdy protection for your pet, and gives your pet a firm surface to stand on. EASY FOR STORAGE & COMFORTABLE INSIDE: The soft sides can be folded down so the whole carrier fits into a neat little package -- just the top and bottom zippered together. Takes up very little storage space while it's not in use. A padded mat in the floor gives your pet a comfortable place to lie down and a non-slip surface to stand on. A see-through mesh door lets him or her keep an eye on the world outside. EXTRA-SAFE & BREATHABLE: The carrier is made from premium materials, YKK zippers, and panels of tough but breathable mesh. The base and top cover of this carrier are hard and waterproof, while the middle is soft, foldable and very ventilated. There is also a soft bed inside for your cat’s comfort. All three components zip together so you can compact it all down for storage. The front door is mesh, so your cat has a view out into the world (and lots of breathability). The door zips shut, but it also has a little clip to the zipper from accidentally opening during travel. One downside is that there aren’t multiple openings for getting your kitty cat in and out. You could maybe find a way to open the top cover and plop your cat inside, but since the top isn’t an actual door it might not be the quick zip and shut you need when trying to get your cat in a carrier. For a super affordable but durable cat carrier, we recommend this soft-sided one from Amazon. It looks and carries kind of like a gym bag, and opens both in the front and on the top. The sides are all mesh which provides excellent ventilation, however sometimes cats need the sides of a carrier to be opaque so they feel safe and secure. This carrier would be even better if there was a way to cover up the sides. The top and front zip shut, however there isn’t a way to lock the zippers shut like with other carriers. It does however have a removable base insert to create a solid platform for your pet to stand on, as well as a very soft fleece bed that we’d honestly love to take a nap on. This cat carrier is also great because it comes in three sizes to get that perfect fit according to the length of your cat. Each size carrier can hold a cat that weighs up to 16 pounds. Some of the reviews said that it runs a little small, so you may need to get a size up if your cat is in between sizes. It also has multiple straps for easy carrying and securing in your car to ensure your cat’s safety. So if you need a low-cost cat carrier and think your cat would be okay with the mesh construction, we recommend going with this AmazonBasics cat carrier. You want the absolute best for your best feline friend. That means providing them with not only a cozy and soothing carrier, but also one that is safe, secure and durable. It should also be comfortable for you to carry around, because it is a cumbersome job. We truly believe that the carriers on this list are some of the best out there because of their durability, practical features and comfort level. However, we don’t know your cat like you do. You know your cat’s behavior patterns better than anyone, so you should let that knowledge guide your decision when buying a cat carrier. But we of course hope that this list helps point you in the right direction – especially in terms of the various characteristics you want to see in an excellent cat carrier. One last word of advice: before you make any purchase, you might want to measure your cat. We know it might not be the easiest trying to measure your cat, but you should at the very least figure out how long your cat is. Then you can be absolutely sure that you are buying a carrier that is big enough for your cat to comfortably move around. As we mentioned before, your cat carrier should be about 1.5 times the size of your cat. Your cat is probably going to be stressed out when you put them in the carrier, so you want to make sure it’s as anxiety-relieving as possible! No matter which cat carrier you get, make it into a nice and soft little cave for your feline buddy. If there’s a good time to spoil your cat, it’s during the moments when they’ll be away from the comforts of their home. So go ahead and splurge a little on your cat carrier!